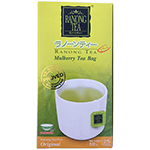 Mullberry tea was accepted and used in Asia for especially in Japan, Korea. Mulberry is rich in GABA to reduce blood pressure, Phytosterol to reduce cholesterol and Deoxnojirimaisin to reduce blood sugar level and without caffeine and tannine. Product of Thailand.